Eastern Portage County is known for its rolling hills, remnants from the glaciers in the area. Get some wonderful winter views by hiking or snowshoeing the 5-mile segment of the Ice Age Trail, just south of the Little Wolf River Fishery Area. Parking is available off of Highway Z, just east of Sunset Lake Road. 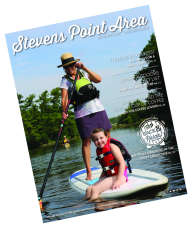 From Stevens Point, take Highway 66 East, to County Road Z, parking will be on the left. Features: The Ice Age National Scenic Trail is a thousand-mile footpath (entirely within Wisconsin) that highlights these Ice Age landscape features while providing access to some of the state's most beautiful natural areas.